Following a ship accident, the crew of a yacht is forced to land on an island filled with underwater Nazi-zombie. By director Ken Wiederhorn (Return of the Living Dead II), Shock Waves is one of the early ancestor of the Nazi zombie genre (not the first one though, there exist quite a few earlier ones). This movie is definitely B-movie oriented, but unlike other similar movies, this one manage to produce an extraordinary atmosphere. These marine zombie are something that you won’t see anywhere else. The way they lurk in the water, walk at bottom and then surface to kill is really great. Seeing the all commando surface at once is such a vision of doom. The pursuit in the mangrove is 30 minutes long unforgettable moment. 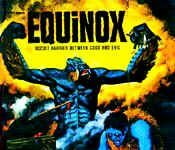 The movie manages to be menacing yet it does not feature a single once of blood (the zombies mainly drown their enemies). 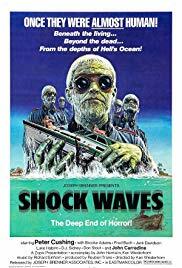 In many way Shock Waves reminds of Italian exploitation classics such as Fulci’s Zombie, or even the claustrophobic Cannibal Ferox (the jungle settings, the grain of the picture, etc). The loud synthetic music is here too, to help building the oppressive atmosphere. Sadly, the action gets a bit repetitive towards the end, and the ending really lacks of a proper conclusion. It is too bad because this movie, often under-looked, has its place amongst the very best 70’s movies – and could have been a classic if it wasn’t for the ending.